I adore fresh egg pasta; it’s fairly quick and simple to make and you can experiment by adding your own favourite herbs and spices to it. Fresh egg pasta is also surprisingly easy to make, especially if you are using a pasta machine. Our pasta machine has 2 cutting attachments – a spaghetti cutter and a tagliatelle cutter and a variety of thickness settings, depending on what type of pasta you are making. I occasionally have trouble getting hold of type ‘00’ flour in my local shops, however you can easily get by using half plain flour and half strong white (bread) flour. Sieve your flour into a large bowl. Create a small well in the middle and crack your eggs into the middle of your well. Slowly beat the eggs, incorporating a little of the flour at a time, until your dough combines. Use your fingers to scoop up any leftover flour and kneed into a ball. Lightly flour a clean work surface and place your dough on it. You should now kneed your dough until it becomes smooth and elastic. It usually takes me around 10 minutes to get to this stage, but you can check by stretching your dough; if ready, it should string back into shape and feel silky to touch. Wrap you dough in cling-film and put in the fridge for around 30-45 minutes. When you pull your dough out of the fridge, you need to set up your pasta machine, ensuring that its firmly clamped in place, or it’ll be shifting all over the place whilst your roll out your pasta. Lightly flour the surface round the pasta machine, which needs to be set on the widest setting. Split your dough into 2 balls, to ensure it is thin enough to go through the machine. You may need to use a rolling pin just to start it off. Roll the dough through the machine on the widest setting, then move the machine down 1 setting and roll through again. Then fold your dough in half, move your machine back to your widest setting and roll through again. Repeat this process around 6 times, or until the pasta becomes silky and smooth to the touch. At this stage you need to roll your pasta through one setting at a time, starting with the widest. When making spaghetti or tagliatelle, I usually for for setting 5 (halfway between the widest and narrowest settings), however for filled pastas it needs to be a little thinner (around setting 7 or 8). 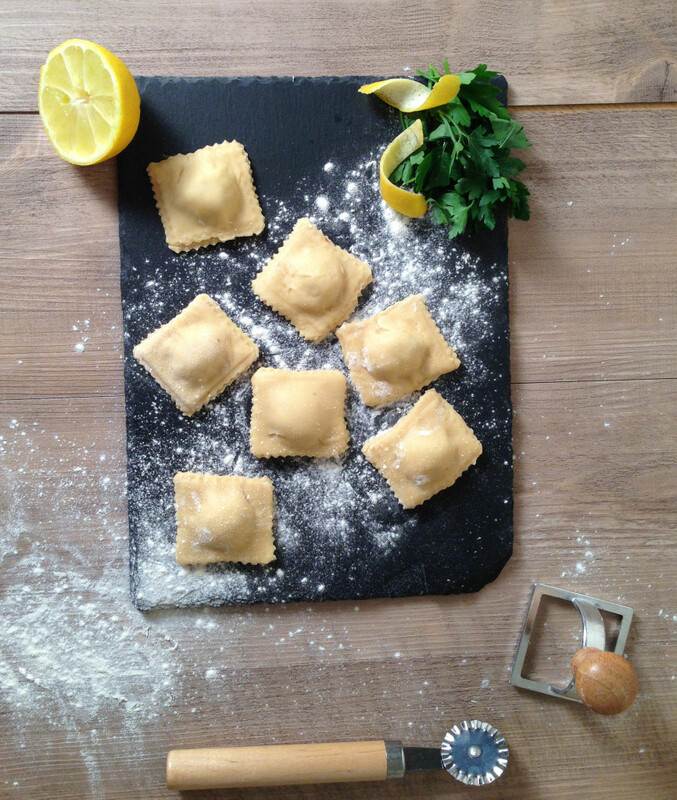 Once you have rolled out the pasta, it needs to be cut or shaped quickly, so that it does not have the chance to dry out. 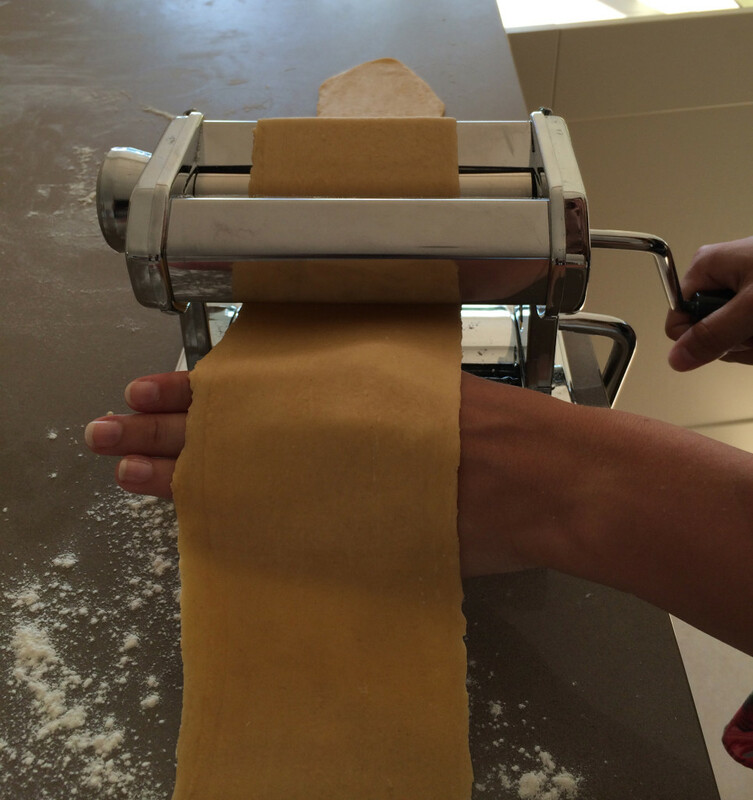 If you are cutting your pasta, add either the tagliatelle or spaghetti attachment and roll through the machine.